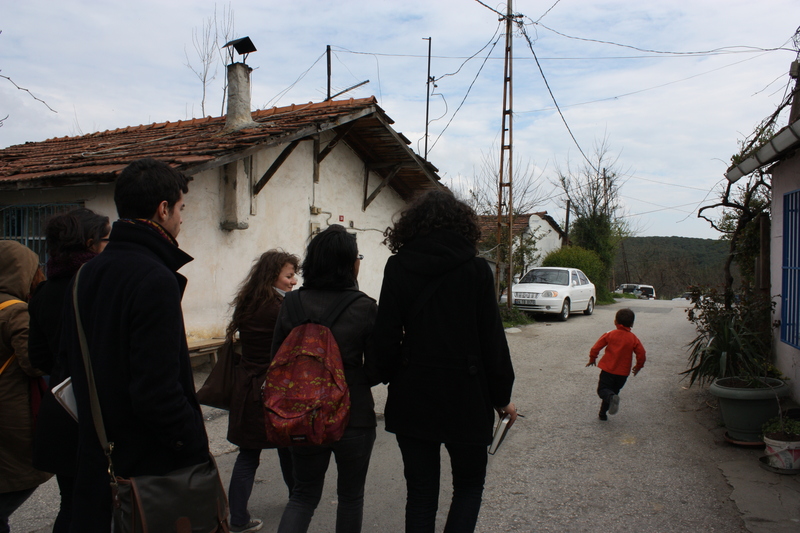 During the tour guided by Jean François Pérouse, Ayfer Bartu and Tuna Kuyucu, we have seen two kinds of settlements: gecekondus and satellite-towns. First, there were some migrations and settlements in gecekondu because there was a promise of work, especially in factories. In the 90’s: people fled the war in south-east Turkey. They were left destitute and had nowhere to go, that’s one of the reasons why they moved to a big city. Today, most of the inhabitants have precarious jobs with low income and without social protection (construction or bus services). In Arıcılar (the first gecekondu neighbourhood we visited), people produce honey. In Ayazma, inhabitants were refused a job on the TOKI construction site or they were proposed 30LT instead of 75LT per day. During this second day we explored Istanbul’s peripheries and transformation areas, starting with the informal settlement called Arıcılar, where the construction firm Ağaoğlu just made a deal with the inhabitants so they will leave the place and they can build some luxury residences. On the way we also passed by the Avrupa Konutları (Europe Houses), a gated community built by TOKI (the Mass Housing Administration, directly under the control of the Prime Ministry) for upper-middle classes. 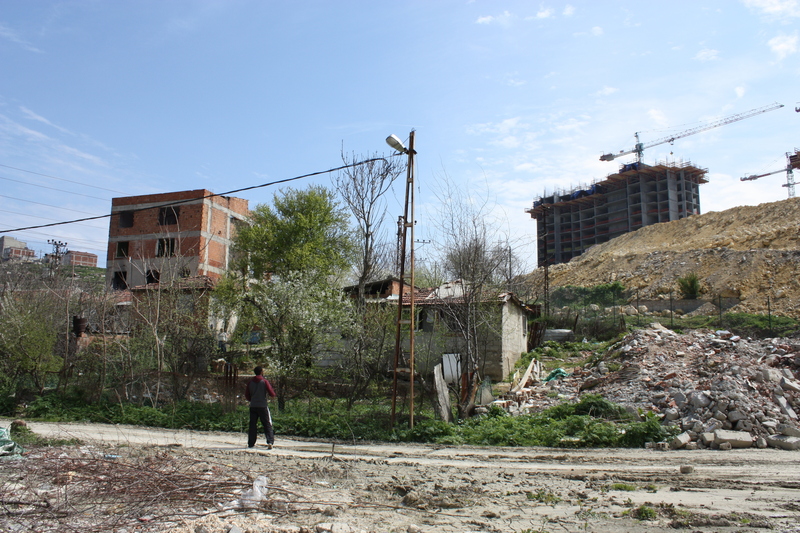 Then we went to Ayazma, an informal neighbourhood located in the district of Küçükçekmece which was destroyed as part of a “regeneration plan” in 2006 (only 2 years after the neighbourhood had been connected to the public water network). 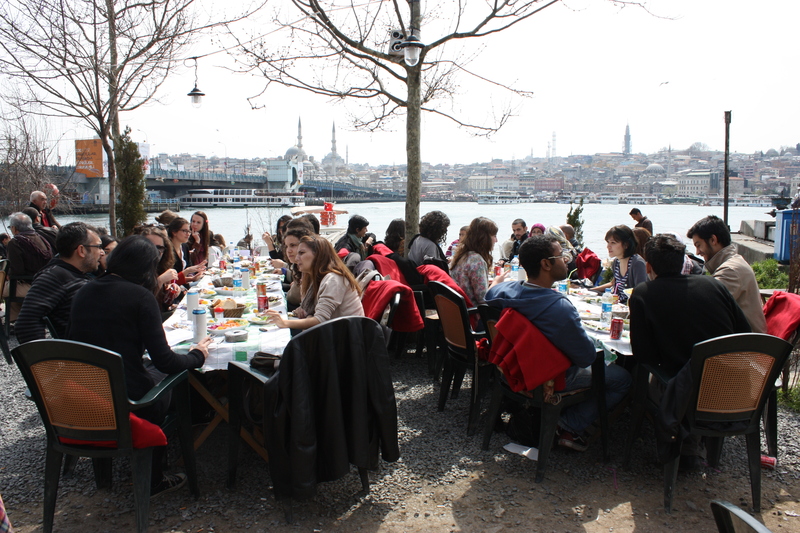 The start of the workshop was given at one of Karaköy’s fish-houses where the students and professors coming from various universities in Cairo, Paris and Istanbul who will take part into the workshop met for the first time. After this “welcome lunch” where each of us introduced himself, we joined the public meeting organized at the Mustafa Kemal Center in Karanfılköy (Beşiktaş) by the Platform of the Neighbourhood Associations of Sarıyer. Welcome to this blog dedicated to the workshop & seminar “Promoting Urban Rehabilitation with the Neighbourhood”. 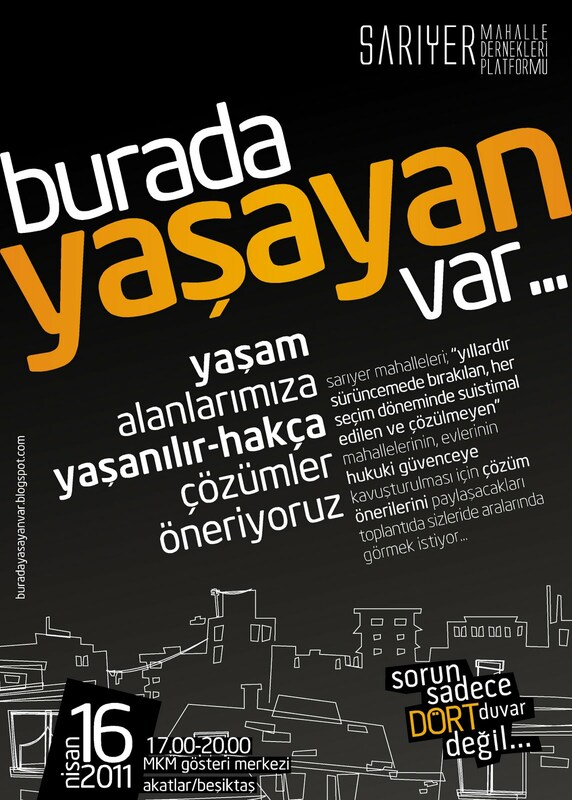 This collective and multi-disciplinary took place in Kazım Karabekir neighbourhood (Sarıyer, Istanbul) between 16 and 22 April 2011. It was organized on three main stages: visits and conferences; on-site intensive analysis; studio work and public discussion in the neighbourhood. You will find more information about this workshop on the pages ‘About the workshop’, ‘Participants’ and ‘Program’. Many documents (videos, posters, maps, etc.) are also available on the page ‘Resources and Media’.